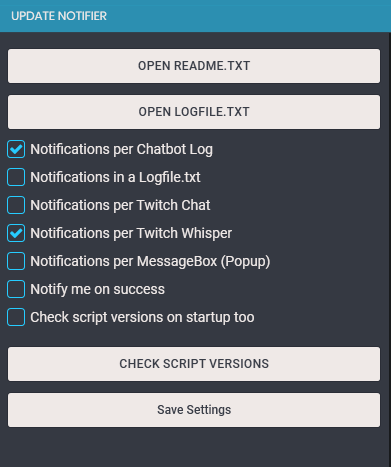 This script is capable of detecting a change of song in the default Streamlabs Chatbot textfile and upon doing so it will announce the new song in chat. Also this script is outfitted with overlay capabilities to show the new song on the stream using a browser source. When playing songs and/or songrequests make sure the mode is set to ‘Chatbot’. When you are using Spotify Client to play music, make sure the Chatbot is connected to Spotify and set the mode to ‘Spotify’. This script also adds the following two custom parameters that can be used in the build in command system to expand current available song(-request) parameters. Is replaced with the previous played song title if any else it will be “None”. This parameter should work properly after the 2nd song is being played after the start of this script. Is replaced with the previous song requester if any else it will be “Nobody”. This parameter should work properly after the 2nd song is being played after the start of this script. This script is also pushes data to the Chatbot websocket when a new song is detected and can be used to dynamically show the new song with the requester on a overlay. Two example overlays are included in this script, that can be used or adjusted to your style. To custimize one of the example overlays, make sure to copy and rename the folder containing the required overlay files and then edit those, as this will prevent future script updates to revert any changes. "Requester": "The requester of the song"